The US is reportedly expected to reveal a new outline for the Israeli-Palestinian peace process after the US embassy opening in Jerusalem. The plan will include compensation to the Palestinians, a senior political source told Hadashot. The new American outline for an Israeli-Palestinian peace deal will be revealed after the American embassy opening in Jerusalem and will include compensation to the Palestinians, a high-ranking source told Hadashot news on Saturday. The compensation is meant to bring the Palestinians back to the negotiating table, said the source. Meanwhile, US Secretary of State Mike Pompeo is scheduled to arrive in Israel today. Pompeo was confirmed last week by the Senate, and unlike his predecessor, Rex Tillerson, he seems interested in playing an active role in the Israeli-Palestinian peace process. On Friday, US President Donald Trump said that he may visit Israel for the Jerusalem embassy opening in May, taking Israeli officials by surprise. Trump’s comment about his possible appearance at the ceremony was surprising since there is no plan for such a visit and Trump is not included in the list of attendees provided by the Americans, Hadashot news reported. Trump also talked about the low moving costs of the embassy. According to the President, his suggestion to use and remodel a pre-existing building reduced the costs from $1 billion and the duration of the move to only three months. Citing what it said were multiple sources, Israel’s Channel 10 News on Sunday night quoted what it said were remarks made by the crown prince at the meeting that left those who were present “staggered” by the ferocity of his criticism of the Palestinians. “For the past 40 years, the Palestinian leadership has missed opportunities again and again, and rejected all the offers it was given,” the Saudi leader reportedly said. “It’s about time that the Palestinians accept the offers, and agree to come to the negotiating table — or they should shut up and stop complaining,” he reportedly went on. Prince Salman also told the US Jewish leaders that “the Palestinian issue is not at the top of the Saudi government’s agenda” and elaborated, “There are much more urgent and more important issues to deal with — such as Iran,” according to the TV report. Nonetheless, the crown prince reportedly stressed that there would have to substantive progress toward an Israeli-Palestinian accord before the Saudis and other Arab states would deepen their relationships with Israel. “There needs to be significant progress toward an agreement with the Palestinians before it will be possible to advance negotiations between Saudi Arabia and the Arab world and Israel,” he was quoted saying. The TV report dated the meeting to March 27, during the prince’s extensive visit to the US. It did not name those present. 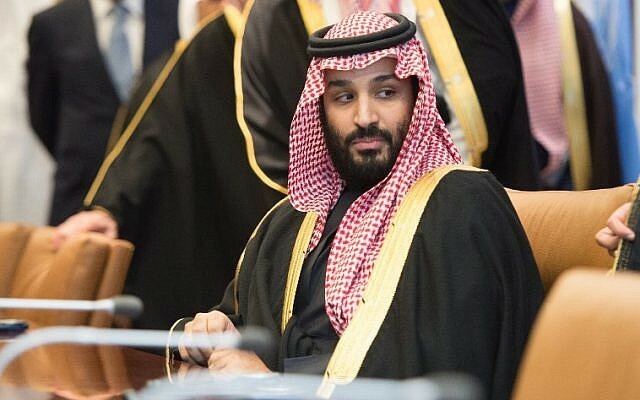 The Saudi Embassy said that the crown prince was to have met that week with Jewish leaders, including Rabbi Rick Jacobs, president of the Union for Reform Judaism; Rabbi Steven Wernick, head of the United Synagogue of Conservative Judaism; and Allen Fagin, executive vice president of the Orthodox Union. That meeting, however, which also included Christian leaders, took place on March 28. The TV report was based on a cable to the Foreign Ministry from an Israeli diplomat in the New York consulate, who was briefed on the meeting by those present, and three other sources who were familiar with the content of the meeting. One of those present told the TV channel that the group was staggered by what the prince had to say, and all but fell off their chairs. A number of news reports, including by The New York Times and Reuters, have claimed in recent months that the Saudi crown prince has pressured Palestinian Authority President Mahmoud Abbas to accept a much-anticipated Trump administration peace proposal. No specific details of what the faith leaders and crown prince spoke about were released. In an interview published a few days later, the crown prince recognized Israel’s right to exist and extolled the prospect of future diplomatic relations between his kingdom and the Jewish state. In an extensive interview with The Atlantic’s Jeffrey Goldberg, the prince laid out his vision for the future of the Middle East, including the possibility of cooperation with Israel. Israel and Saudi Arabia have no official relations and the kingdom does not recognize the Jewish state. Israel has hinted at clandestine ties with Saudi Arabia in recent years, stressing the two countries share an interest in countering Iran. The rumors of covert relations have been denied by Saudi officials. Still, a Saudi general visited Jerusalem in 2016 and met with Israeli lawmakers, and Saudi officials have met with Israeli officials on several occasions in public. Saudi Arabia also allowed Air India to fly to and from Tel Aviv via its airspace, last month. Shortly afterwards, Saudi King Salman reaffirmed his nation’s support for the Palestinians in a conversation with US President Donald Trump. “You’re an incredibly important partner [and] occupy a special place in my heart too,” Pompeo told Netanyahu in Tel Aviv. Pompeo, a fierce critic of the Iran nuclear deal, is on his first trip abroad as secretary of state. His first stop was Saturday in Saudi Arabia, and Iran is reportedly top on his agenda. Watch the video and see the warmth between the Israeli leader and the top US diplomat! Mike Pompeo visits Saudi Arabia, Israel and Jordan two days after taking office • U.S. is unlikely to remain part of the 2015 nuclear deal with Iran unless substantial changes are introduced • Policy adviser: Iran’s missile programs to be the focus of the trip. U.S. Secretary of State Mike Pompeo arrived in Saudi Arabia on Saturday on his first visit to the Middle East, as the United States aims to muster support for new sanctions against Iran. The visit to Riyadh, Jerusalem and Amman just two days after Pompeo was sworn in comes as President Donald Trump is set to decide whether to pull out of the 2015 nuclear deal with Iran that is still supported by European powers. On January 12, Trump challenged Britain, France and Germany to fix what he has repeatedly called the “disastrous flaws” in the nuclear deal, or he will pull America out of the accord. His decision is expected on May 12. Pompeo was scheduled to arrive in Israel on Sunday and meet with Prime Minister Benjamin Netanyahu. The two were expected to discuss the Iranian threat and Trump’s pending decision on the nuclear agreement, Iran’s efforts to entrench itself militarily in war-torn Syria, the impending relocation of the U.S. Embassy in Israel from Tel Aviv to Jerusalem, currently set for May 14, and the Palestinian response to this move. I think that it is important that he is coming to Israel as part as his first overseas visit as secretary of state. I will discuss with him regional developments, Iran’s growing aggression and of course the nuclear agreement with Iran, on which there will be a decision soon,” the prime minister said at the begining of the weekly cabinet meeting. While former Secretary of State Rex Tillerson was widely seen as a voice for moderation in the Trump administration, Pompeo, a former CIA chief, army officer and conservative congressman, is a hawk who, together with new White House National Security Adviser John Bolton, could back Trump’s aggressive posturing on the world stage. Pompeo set off on his first diplomatic trip within two hours of being sworn in on Thursday, arriving in Brussels for a meeting with NATO allies. Speaking after the meeting, Pompeo said Trump had not made a decision on whether to abandon the nuclear deal but was not likely to stick to it without substantial changes. “There’s been no decision, so the team is working and I am sure we will have lots of conversations to deliver what the president has made clear. … Absent a substantial fix, absent overcoming the shortcomings, the flaws of the deal, he [Trump] is unlikely to stay in that deal past this May,” he said. Brian Hook, a senior policy adviser traveling with Pompeo, said that Iran’s missile program would be one of the focuses of talks with Israel and the Saudis. “We are urging nations around the world to sanction any individuals and entities associated with Iran’s missile program, and it has also been a big part of discussions with Europeans,” Hook told reporters in Riyadh Saturday. Both French President Emmanuel Macron and German Chancellor Angela Merkel have been lobbying Trump not to exit the nuclear deal. Macron, who met with Trump last week, warned that while the deal can be improved, there was no “plan B” in place. Merkel admitted that the existing international accord on Iran fell short of curbing the Islamic republic’s nuclear aspirations, but stressed it was a “first step” that prevented Tehran from developing nuclear weapons. On Friday, Trump surprised reporters at the White House by saying he might travel to Israel next month for the opening of the U.S. Embassy in Jerusalem. The White House said last month that Trump would not attend the dedication ceremony over preparations for his meeting with North Korean leader Kim Jong-un. He added that the new embassy “is going to be beautiful. And it will be somewhat temporary, but it could be for many years.” The president was referring to the fact that a permanent location for the new embassy within the Israeli capital has yet to be selected. “The embassy in Jerusalem has been promised for many, many years by presidents. They all made campaign promises and they never had the courage to carry it out. I carried it out,” he stressed. U.S. president’s bid to change 2015 accord includes demands to which neither Iran nor other world powers can agree, Mohammad Javad Zarif says • French leader said to be trying to “rebrand” parts of the deal to save it • Zarif: It’s either all or nothing. Iran’s Foreign Minister Mohammad Javad Zarif said on Saturday that demands by U.S President Donald Trump to change Tehran’s nuclear deal with world powers were unacceptable. Zarif said Trump has always opposed the deal and U.N. Security Council Resolution 2231, which endorses the Joint Comprehensive Plan of Action, and has today excessive demands “which are neither acceptable to us nor to other members” of the accord. The American president sees three defects in the agreement: a failure to address Iran’s ballistic missile program; the terms under which international inspectors can visit suspect Iranian nuclear sites; and “sunset” clauses under which key limits on the Iranian nuclear program start to expire. Meanwhile, French President Emmanuel Macron’s talk this week of a “new deal with Iran” may not, in fact, represent anything new nor a deal with Iran. Under the accord, Tehran agreed to limit its nuclear program in return for relief from U.S. and other economic sanctions. Macron’s “new deal,” at first glance, appeared an effort to rebrand something already under discussion between the United States, Britain, France and Germany, to try to save the existing agreement. “This is, indeed, consistent with what we have been talking about for six months,”aid a French official on condition of anonymity, adding that Macron hoped to persuade Trump to stay in the existing deal with the fix under discussion but also to keep the door open to further talks even if he abandons it. Negotiators among the United States as well as the three European powers have been working to try to finesse these issues so as to keep the U.S. in the agreement without driving Iran – which opposes any changes to the deal – out of it. Perhaps in reaction to Trump’s opposition to the deal, Macron appeared to be trying to preserve space for diplomacy even if Trump revives U.S. sanctions on Iran in a few weeks. “The impression I get is that … he simply wanted to preserve some kind of perspective of a political process even if there is a negative decision on May 12,” said the diplomat. “I think he was talking more about a supplemented deal than a new deal,” said Robert Einhorn, a nonproliferation specialist at the Brookings Institution. “He knows that President Trump would prefer the deal to be new, so I think that’s how he characterized it, but I think what he is really talking about is embedding the existing JCPOA in a broader package. Ayatollah Ali Khamenei reportedly unhappy with corruption rumors attributed to Maj. Gen. Ghasem Soleimani, the head of Revolutionary Guard’s black ops force, as well as “strong differences of opinion” between three top Revolutionary Guard generals. Iran’s Supreme Leader Ayatollah Ali Khamenei is reportedly looking to oust Maj. Gen. Ghasem Soleimani, one of the most powerful figures in Iran’s Revolutionary Guard Corps and the commander of its black-ops arm, the Quds Force. The Quds Force is the IRGC’s elite division, responsible for its overseas operations. Quds Force troops are heavily involved in all of Iran’s extraterritorial endeavors, most notably by training and supporting Hezbollah in Lebanon, Houthi rebels in Yemen and Shiite militias in Iraq and Syria. According to a report in Iran’s Arya news agency, Khamenei plans to remove Soleimani from the command he has held since 1998 over “strong differences of opinion” between Soleimani, Revolutionary Guards Commander Gen. Mohammad Ali Jafari and the Iranian chief of staff, Gen. Mohammad Bagheri. The report was removed from Arya’s website moments after it was posted on Friday, but it was still picked up by other Arab news outlets. Some reports claimed that the discord between the three generals was severe enough for Khamenei to consider stripping Soleimani of his command, while others tied the potential move to a broader reform the supreme leader has said he would like to introduce into the Quds Force. Despite these rumors, the Tehran Times reported Saturday that Khamenei actually plans to promote Soleimani and name him Jafari’s successor. The Washington Post reported last week that in 2017, Qatar paid some $275 million to Iraqi and Iranian officials to secure the release of 25 Qatari nationals, including nine members of the royal family, who were abducted last year in southern Iraq. According to the report, at least $50 million was paid directly to Soleimani. The meeting between North Korean President Kim Jong Un, otherwise known as the rocket man, and South Korean President Moon Jae-in is more than an average feel-good news item. It is a turning point in the global geopolitical alignment. Almost all the credit goes to U.S. President Donald Trump. The leaders of the two Koreas are officially ending their countries’ 65-year-old war and have set a mutual goal they aim to reach through continued negotiations – denuclearization of the Korean Peninsula. The next stage will be a meeting between the rocket man and the king of tweets, Trump – reviled by the journalistic punditry and American-international foreign policy establishments. About a year and a half ago, I interviewed one of the more renowned experts on the Iranian nuclear issue and the comprehensive policies toward Tehran, Mark Dubowitz, from the Washington-based Foundation for Defense of Democracies. When comparing North Korea and Iran, Dubowitz said at the time, the Iranians were the more dangerous of the two. The main reason for this, he said, was that North Korea lacks global pretensions and is preoccupied with its own survival. Throughout this entire period, Kim Jong Un has appeared more menacing, as someone poised to plunge the world into nuclear war. It now appears clear that North Korea is the lesser problem. President Trump, by transcending the accepted norms of the American establishment, created a new situation presently conducive to fundamentally resolving – albeit still not completely or assuredly – the North Korean threat. The success on the Korean front has to affect the Middle East as well, even though it is liable to ruin the appetite some pundits have for war with Iran. Trump and Prime Minister Benjamin Netanyahu are perceived as credible when it comes to their threats and actions. Trump has brought Islamic State to the brink of extermination – another achievement for which he receives no credit. He has attacked twice in Syria, displaying an ability to quickly rally Western coalitions for both offensive and defensive purposes. Trump’s position would, of course, be better without the scandals at home and the Russian conspiracy investigations. It would make it easier for him to close a deal with Russian President Vladimir Putin. Yet this, too, will not deter Trump, making it exceedingly likely that a scenario similar to the Korean Peninsula will unfold with Iran and its nuclear and imperialistic regional ambitions. French President Emmanuel Macron is now the unofficial leader of the European Union. His unexpected alliance with Trump is proving effective. They will now push toward two parallel goals: an addendum to the nuclear deal with Iran and a deal with Russia and Iran to contain the latter’s regional expansionism. This is within reach. Trump already intimated during his joint press conferences with Macron and German Chancellor Angela Merkel last week that he probably will not withdraw the U.S. from Iranian nuclear deal at this point. In exchange, the French and Germans will work on an agreement targeting Iran’s ballistic missile program and the nuclear deal’s problematic expiration clause.